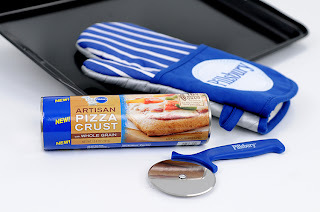 At the Fence: Pillsbury Artisan Pizza Crust Prize Pack! I just have to share with you about what happened with my Pillsbury Artisan Pizza Crust Prize Pack! I was really excited about receiving this pack. It included a coupon for a free Pillsbury Artisan Pizza Crust with whole grain, next was a $10 Gift Card to add our favorite ingredients, a baking sheet, an oven mitt and a pizza cutter. Well.... here is what happened. I unpacked everything and placed it in the kitchen. We had to go grocery shopping, so I picked up the crust and purchased a pizza sauce, pepperoni and mozzarella cheese. Everything was ready to make a pizza. 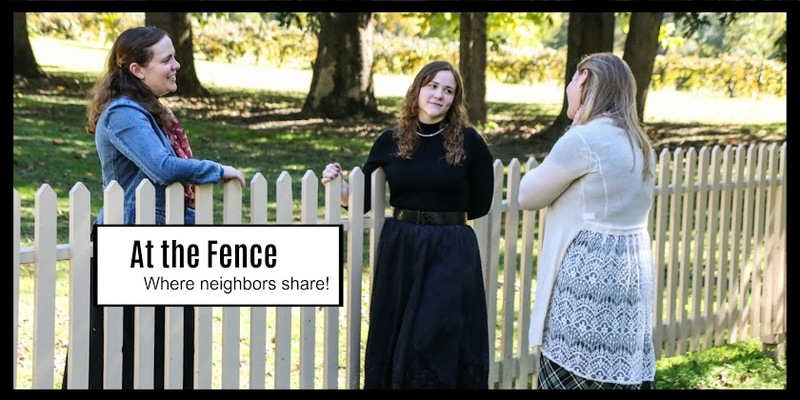 But... my husband, two sons and I had to go out of town for 2 days and we left the girls at home. They called and asked if they could make the pizza and have a girl's night. I just had to say yes! They did take pictures for me! I think she snuck a pepperoni! 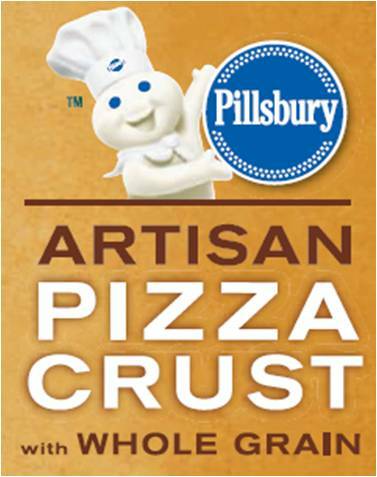 So I would say that the Pillsbury Artisan Crust was a hit. We will be doing this again for a family night. I think we will have to make two pizzas though! Look at all the hands! Be sure to "Like" Pillsbury on Facebook. The you can hop over and follow them on Twitter. Be sure to click here, to get a $1.25 coupon to use when you purchase a Pillsbury Artisan Crust. One neighbor will be receiving a Pillsbury Artisan Pizza Crust Prize Pack. “Disclosure: The product, gift pack, information, and additional sample have been provided by Pillsbury through MyBlogSpark. I would put pepperoni, pineapple and black olives. Broccoli , cheese and onion. I love pepperoni,mushrooms,olives and lots of cheese. I like cheese and mushrooms. If it's just for the girls, it's cheese only. If it's for the hubby and I--cheese, pepperoni, hamburg and onion. mushrooms, pineapple, ham and lots of extra cheese! My daughter and I love tomato & basil pizza with no sauce - just olive oil. I would put pepperoni and ham. Zuch, mushrooms, onions, olives, and green pepper! Sausage, black olives, and tons of cheese! I love veggie pizza, artichoke and zucchini is delicious! Pepperoni, onions, red peppers, cheese. I would use pepperoni and black olives. I like spinach, mushrooms, and garlic sauce on my pizza! Thanks. Roasted garlic and grilled eggplant. I would put sausage,mushroom,onions and green peppers on my pizza. I would make chicken alfredo. I would use grilled chicken, onions, and ranch! Leave a comment here telling me what toppings you would put on your pizza! everything! I'm partial to sausage, peppers & onions, a veggie pizza with tomatoes, broccoli, onions, peppers, mushrooms, spinach & olives, or a chicken parm pizza. But generally speaking if it is pizza, I will like it. I would put BBQ Sauce, Cheese, Chicken, Cilantro, and Purple Onions on it. thanks for the awesome giveawaY! We love sausage at our house so it would be that and maybe some green peppers. I'd probably put Pepperoni, onions, sausage, mushrooms and olives on it. I would make a chili dog pizza with onions, wieners and cheese with chili instead of sauce. Pepperoni, lots of cheese, black olives, onions, tomato slices, green peppers. Cheese, pepperoni, green pepper, onion. I like onions, ham and pineapple on my pizza. I like to put canadian bacon and pineapple on my pizza. I'd put a little garlic on the crust, lots of sauce, cheese and pineapples. Thanks! I would put on peperoni, sausage and mushrooms. I would put pepperoni on my pizza. We like to put pepperoni, sausage, and mushrooms. I would put pepperoni and sausage. Thanks! I would put pepperoni, mushrooms, olives,onions and extra cheese! I'd put canadian bacon and mushrooms on it. Thanks. Pepperoni, black olives and extra cheese! Yummm! I like all the not so good for you topping... pepperoni. bacon and ham.. I'd top the crust with red sauce, hamburger, onions, mushrooms, green peppers and cheese! I usually just like cheese pizza. Although, sometimes I'll eat pepperoni or spinach. I'm a canadian bacon and pineapple topper girl! Garlic and Pepperoni and Spinach would be my toppings of choice! Pepperoni, cheese, mushrooms and sausage! I like just plain cheese pizza. We like cheese, mushroom and onions. I put bacon, turkey pepperoni, onions, garlic & green peppers... yum! I would put pineapple, mushrooms, and bacon. I'd have to put on green peppers. Mozzerella & cheddar cheese, black & green olives, mushrooms, & mild pepper rings. Mushroom, onion, green peppers and Italian Sausage. Pepperoni, black olives and extra cheese. Id use Ham and Onions!!! I like olives and mushrooms. I'd put chicken and onions on it! Canadian Bacon and black olives. I love to put pepperoni and a 3 cheese blend on my pizza! I like cheese, pepperoni, green peppers and mushrooms on mine. Thanks for this contest! I would put all the veggies i could fit on it. Mushrooms onions peppers sound good! I would put spicy sausage, onions, mushrooms, jalapenos, and a white Alfredo sauce. Grilled chicken, mushrooms and sliced tomatoes. Any veggies I have on hand! Thanks! I would put sauteed mushroom, onions and swiss cheese! Pan sausage & Pepperoni is what I would put on my pizza & just a little chees. Just pepperoni. It's the best. Cheese, pepperoni, onion, and mushrooms. Pepperoni, onions, peppers, olives and mushrooms. Pepperoni, chopped green onions, and banana peppers!